Following the death of Rolling Stone and BuzzFeed contributor Michael Hastings in a fiery car crash, and the subsequent revelation of a panicked email he sent to his colleagues just before he died, this question has arisen: could someone have hacked his car? That's unlikely, and here's why. Hastings' 2013 Mercedes C250 coupe crashed into a tree on Highland Ave. in Los Angeles around 4:30 am on June 18. The car burst into flames, and it took the coroner two days to positively ID Hastings' body. It sounds like perfect fodder for a good conspiracy theory. After all, Hastings was a heavy hitter whose 2010 Rolling Stone piece on Gen. Stanley McChrystal ended the Afghan war chief's career and sent shockwaves through the defense community. He had enemies, and his final email implies he was working on something huge related to the NSA and FBI, and that "the Feds" were interviewing his associates. If you believe the government does that kind of thing, it almost sounds like Hastings was taken out somehow. But how exactly? Speaking to the Huffington Post, former counterterrorism czar Richard Clarke claimed that "what is known about the single-vehicle crash is 'consistent with a car cyber attack.'" Clarke said, "There is reason to believe that intelligence agencies for major powers" — including the United States — know how to remotely seize control of a car. "What has been revealed as a result of some research at universities is that it's relatively easy to hack your way into the control system of a car, and to do such things as cause acceleration when the driver doesn't want acceleration, to throw on the brakes when the driver doesn't want the brakes on, to launch an air bag," Clarke told The Huffington Post. "You can do some really highly destructive things now, through hacking a car, and it's not that hard." "So if there were a cyber attack on the car — and I'm not saying there was," Clarke added, "I think whoever did it would probably get away with it." Clarke also says that because the "dozen or so computers" on board the Mercedes melted, it's even harder to trace who may have committed such an act. That's true. University researchers have found ways to crash car computer systems in the lab and there's no reason to believe government agents haven't also figured out how to do the same thing. But there are many, many reasons we need to be stay away from this theory in this case for now. As the Los Angeles Times notes, law enforcement officials are "weeks away" from determining the exact cause of Hastings' death, including what happened to the car and how fast it was going. Moreover, car hacking seems to be the most in vogue fear du jour among Americans lately, what with AOL positing that terrorists are capable of seizing your car's computer remotely and turning it into a high-speed death machine. Our own Jason Torchinsky did a thorough debunking of why this is so unlikely, including how modern cars' internal networks aren't normally equipped to receive wireless instructions and how it's absurd to think that mechanical systems can somehow be easily overridden by a remote signal. Put simply, car hacking isn't what people think it is. You most likely have to have access to a car, then install software, then break through the car's systems. If Clarke is basing his analysis on the university research and not some secret government information, then he should also know that right now this isn't easy. It's actually more plausible to think that someone could have physically tampered with Hastings' Mercedes rather than "hacked" it. You could argue that this would also be a form of "hacking," perhaps literally hacking at cables, but we'll have to wait and see if there's more evidence of this. 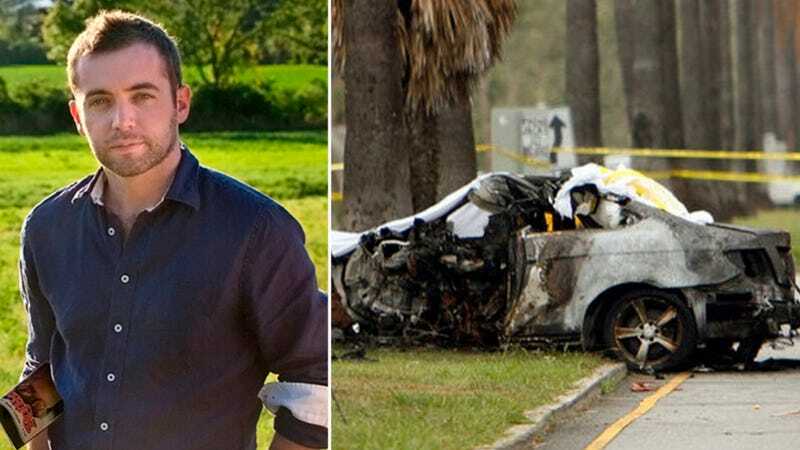 We need to wait until all the facts are in before we start buying in to conspiracy theories because no one has been able to dismiss the most obvious theory: Hastings was working on a big story, as he often did, and then he was involved in a car crashed caused by driver error, speeding, alcohol or some other factor. It could just be a coincidence, and a very unfortunate one that cost the world an immensely talented and dogged reporter. It could also be the clever and malicious work of government agents. We simply don't know yet. And it's not fair to the memory of a man who dedicated his life to uncovering truth for us to blindly buy into the latest thing we're told to be afraid of.